anjelique: My Top 5 Tips for Staying Organised + Blogging! Fellow bloggers, this one's for you! Last month when I undertook the #30DaysofJune blogging challenge, I got a lot of comments about how well I had done with uploading a new blog post everyday. I was very flattered, because I'm known as the worlds biggest procrastinator so it was even more of a compliment for me to read such lovely feedback! It got me thinking that maybe others like myself might need a little push in the right direction when it comes to managing their blogging time so I thought to create a list of my Top 5 Tips on staying organised with blogging. These tips can also be applied to you non-bloggers as well, there's some really great anti-procrastination pointers for you too! I make lists to write lists, that's how much I love them! 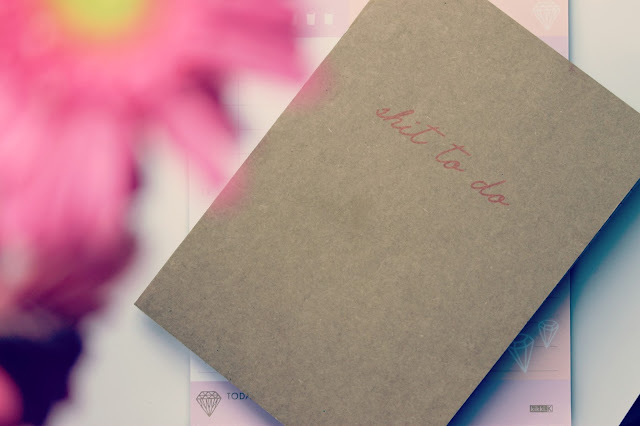 Lists are my top tip for staying organised and on top of everything. Plus, that sense of accomplishment you get when you've ticked off everything on your list is amazing- there's nothing like it! I like to print out blank monthly calendars and pencil in my blog posts for the month ahead. If you're really short on time, you can plan out the next six months of blog posts in about 15 minutes. Inspiration can strike at any moment, anything from a conversation with a friend to something on tv can inspire a future blog post. I like to carry around a little notebook to scribble down any ideas that pop into my head. All those brilliant post ideas won't go to waste anymore! Whether you're working full time or you're a new parent who's time poor, learning to manage what free time you do have will help keep your posting schedule on track. Set aside a day at the start of the month to take all your blog photos for the coming month so when the time comes to actually write those posts late one night when you (finally) have some free time, you don't need to stress about lighting and photography and you can focus on your content. Pick a day where you will be able to schedule a blog post at the same time for every week. Not only does it let your readers know when to expect your blog posts, but it also motivates you to churn them out! I've found with having a scheduled day, I'm less likely to to procrastinate with my time. What are some of your top tips with staying organised and motivated to blog? Do you already implement some of these steps in your blogging 'routine'? Thanks Mel, glad to be of help! Great tips, they make it so much easier to be consistent. Thanks lovely- glad I can help! cool challenge..bravo 2 u!new post is up! I schedule my posts for around a month in advance and use an Excel sheet to keep track of pictures I have taken and texts I have written, otherwise I wouldn't be able to upload regularly. Ooh, that's a great idea! I might try use that to help with my scheduling- great tips! Thanks Lena! Definitely agree, drafting is a great tool! Love all of these tips! I definitely use a few and they really help me stay organized! Thanks Courtney, hope I can help! I've recently completed a similar challenge and got similar results. My tip would be to keep a diary and put as much info about the post you will write as possible. Key words , images needed etc.